If you read part one of this blog series, you already know how important it is to plan ahead and start packing early for an office move, donate outdated or unused office equipment, and stay organized as you pack things into moving boxes. 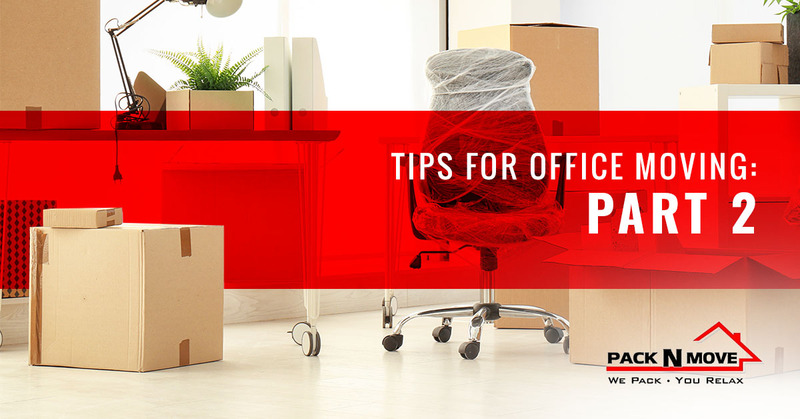 Of course, business relocation entails a lot more than purging the office of clutter and putting things into packing boxes for moving, so here are a few more tips from our office movers at Pack N Move in Visalia! While it can be tempting to try and do all of the office packing yourself, packing and moving larger or more delicate items like computer monitors often require the help of a professional mover. All too often, business owners have their employees pack up their entire desks, computers and all, which can result in damaged or broken office equipment. Nothing adds stress to an office move like broken computers, lost data, and missing cords, so don’t gamble by trying to pack and move these things yourself. Commercial movers have the skills and experience necessary to handle expensive, delicate, or bulky office equipment without damaging it, so more often than not, it’s worth it to spend a little money upfront rather than dealing with equipment repairs or replacements later on. Another major mistake businesses make when it comes to office moving is skimping on cheap packing materials, which can fall apart during the move. If there’s one piece of advice you take from this blog series, it should be to invest in some high-quality moving boxes, heavy-duty packing tape, and plenty of bubble wrap for computer monitors, copiers, etc. No matter how carefully the moving trucks drive, items that aren’t properly packed can get damaged and break. That’s why we offer professional packing and moving services for businesses of all kinds; our team has the best packing materials for any size and scope of commercial move and can pack everything the right way so nothing is damaged. At the end of the day, the best way to ensure that your office move goes smoothly is to hire a commercial moving company to pack and move your belongings safely and efficiently. Most business relocation slow-downs and accidents are due to DIY moving attempts, so if you want to hit the ground running at the new location and resume business operations quickly, getting moving help from your local moving company is the way to go. Professional movers will also offer upfront moving quotes and insurance options in the event that something were to get damaged during your office move, so be sure to take advantage of those perks as well if you hire a moving company. If you are planning to relocate your business from Visalia, Fresno, or the surrounding area and are looking for professional moving help, hire our commercial moving team at Pack N Move! All of our office movers are trained in handling office equipment, office furniture, and other specialty items so they make it to your new office location safely and on time. Contact us today for your free moving quote!